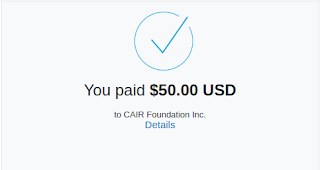 I am happy to report that thanks to your generosity, BWP has just paid another $50 dollar donation to CAIR! 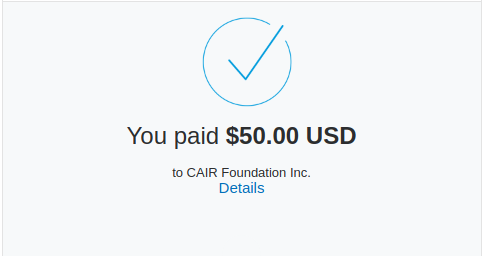 With that, I am concluding the CAIR campaign, and announcing a new one. Effective immediately, all future profits from BWP book sales will be donated to Lambda Legal. Lambda Legal are even now preparing to fight against Trump's grotesque and unconscionable ban on transgender troops, and I hope that I can contribute to that fight in my own small way. Trans rights are an incredibly important issue to me, and I have no doubt in my mind that this ban, along with other utterly immoral actions taken by Trump and Pence towards trans and LGBT people of all stripes this year are just the tip of the iceberg. We must fight, on every front, to stop this fascist administration before it does any further harm. I am urging you all, even above charitable works: pressure your congressmen and women, tell them we must stop Trump before it's too late. We must put an end to this escalation of bigotry, fascism, and white supremacy, before more blood is spilled, or else Charlottesville will only be the beginning.